Alongside the painful and heart-wrenching events of the last few years, there have been a number of positive developments—many of which are culminations of efforts that began long ago. Movement actors are increasingly working in networked ways across issues to provide opportunities for systems-level change. Cross-movement collaborations between immigrant rights and economic development groups have resulted in promising opportunities for integrating immigrants’ experiences into regional economic plans. Racial justice has become foundational to strategies for change among reproductive rights organizations, climate justice advocates, and philanthropic institutions. These are just a few examples of the positive developments that bring us hope. We first shared approaches and practices for embracing these elements through a series of articles published in the Nonprofit Quarterly where we looked at each element separately. 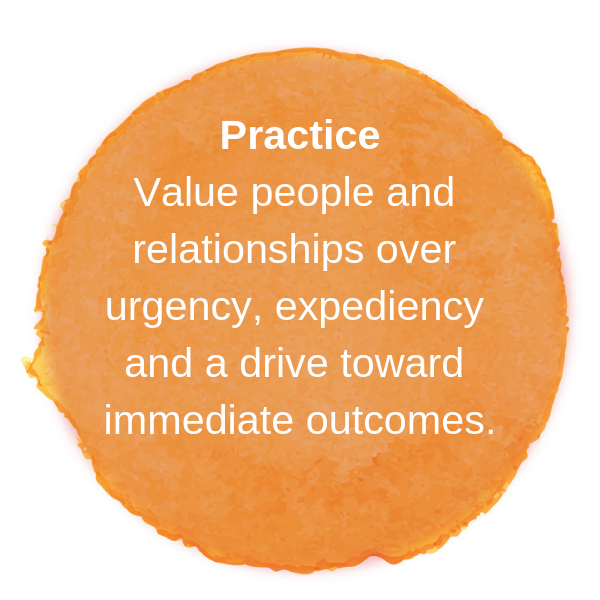 On their own, these elements are essential components of advancing transformative justice. However, the real power comes from approaches that draw on the interconnectedness and interdependence of these elements. When intentionally engaged together, they comprise a liberating context with deep equity at the core. This hand—a miracle of veins, nerves, bones and skin—hand in hand with others is what is needed to create a more equitable, just and sustainable world—to indeed live liberation. Attending to the relationships between these elements, these fingers of one hand, looks different for different practitioners, but there are some important themes emerging from these efforts, ones that can help us all deepen our interconnected practices. We begin with an exploration of the practices that hold deep equity as the rhythm that defines and anchors liberating compositions—as the hand’s opposable thumb. As our current political climate, the accessibility and prevalence of media, and the work of many people are making violence and injustice from the systemic to the interpersonal more visible and known, shifts are taking place within the various spheres of the justice ecosystem moving the whole ecosystem toward a practice of deep equity. Deep equity is a cultural revolution, one that encompasses honoring differences; recognizing the impact our identities and positions have on our individual and collective experiences; focusing on relationships and whole beings with multiple identities; addressing trauma and healing; and eliminating systemic disparities. 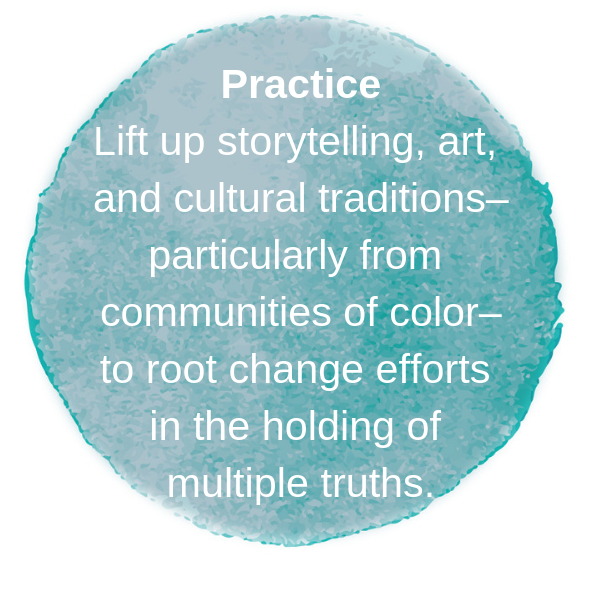 These practices are just a few of the ways individuals, organizations, and networks are working to embrace and embody deep equity. As awareness of the endemic racism, sexism, homophobia, xenophobia (the list goes on) in the United States increases, many organizations are also demonstrating a commitment to advancing systems change that centers equity and addresses the root causes of persistent social problems. We turn to the promising practices from these efforts next. Despite increased attention towards systems change efforts that address root causes, many of these efforts have failed to acknowledge the historical and present conditions, structures, and practices that maintain inequity. This can be readily seen, for example, in philanthropic efforts to address poverty in which race is neither recognized as a corollary nor causal connection. And yet most, if not all, current poverty data—not to mention historical memory—looking at both the instances and persistence of poverty demonstrate how race and economic circumstances are inextricably tied. Much of the system-level work on social justice is funded and therefore influenced by philanthropy. Given the history of the philanthropic sector, grantmaking institutions are often quite challenged with truly centering equity in systems change efforts. However, there are promising practices emerging from several grantmaking organizations that are on the journey to center equity in their systems change efforts. And in doing so they are transforming not only their grantmaking approaches but also their understanding of both the problems and potential solutions. For Pia Infante, a queer, first generation Filipina and co-executive director of The Whitman Institute—a philanthropic institution based in San Francisco—complex systems change requires centering those most impacted by unequal structures and systems. “When looking at environmental, political, and economic destruction,” she says, “it is clear that the brunt of its impact is on black and brown women.” But black and brown women are rarely at the center of grantmaking efforts. In a post reflecting on the 2018 Grantmakers for Effective Organizations (GEO) Conference, Pia outlines many uncomfortable truths about philanthropy’s complicity in maintaining structural and economic racism at the same time that it strives to advance systems change efforts to addresses today’s most intractable problems. Pia believes that it is critical to pass decision-making onto the community, but, she says, in order to do so, “grantmakers have to be brave, radical, and embodied.” Grantmakers must build relationships of trust with communities. And, in doing so, grantmakers are called on to reimagine many of their existing practices and roles. In her own work, Pia asks the philanthropic sector to take a good look at themselves in the mirror. “Wealth, whether inherited or created newly, is built on a system of inequalities where a small few [extract] profit from the work of many. Historically, the wealth of the U.S. is built on stolen lands and bodies.” If this is not acknowledged, efforts to center equity fall short. For example, grantmakers “living into accountability” are expanding the time horizons for investments. Thousand Currents—a foundation based in the San Francisco Bay Area that funds grassroots groups led by women, youth, and Indigenous Peoples in the Global South—has been doing just that since its founding in 1985. They provide multi-year grants of support, investing in grassroots groups that are building the cultural and political power of the communities who are most impacted by global injustices. Drawing on “grassroots brilliance” Thousand Currents funds what is most needed for the time duration that it is needed as defined by grassroots groups. As a result, Thousand Currents has been able to support organizations in building community capacity, financial resilience, and networked ecosystems to achieve meaningful impact. “Why,” Pia asks, “is the default grant time one year? We are funding solutions to poverty, to stopping rampant deportations.” These are complex problems that developed over generations, centuries, millennia. In order to solve such problems, grantmaking efforts need to be focused on more longitudinal time commitments; this is critical to supporting more enduring solutions. Those that are investing for the long haul are advancing systems change and doing so in a way that amounts to looking, thinking, and behaving–doing and being–differently. As Pia notes, they are building relationships rooted in trust, centering those most impacted, and shifting power. 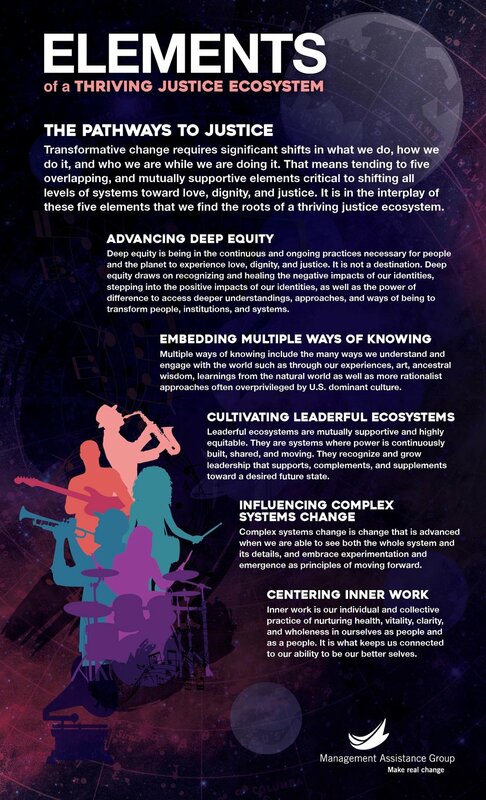 The melody that holds the cadence of systems change and the rhythm of equity together emerges only when the being and doing are in sync—when the values of love, equity, trust, and justice are truly embodied (the being) and approaches, behaviors, and practices (the doing) reflect these values. Being in sync is not a linear or simple process; one can expect to be off key or out of rhythm sometimes, especially when we prioritize or are over-reliant on very limited sources of information (and often not the best ones for understanding the problem). Embracing multiple ways of knowing is central to these synching efforts—we explore its role next. Centering equity in complex systems change requires us to engage multiple perspectives and experiences in order to define both problems and solutions. To engage multiple perspectives, we need to draw on more than knowledge restricted to the intellectual and academic realms of numeric analysis, logic, theory, and rationalist approaches to truth. We need to lift up ancestral wisdom, intuitive knowing, the insight of the arts with their ability to represent complexity, and the ancient knowing of nature. Without surfacing these multiple ways of knowing, we lose access to ourselves, our connections to each other and to the environment around us, and in so doing, we lose access to transformational approaches to creating a world in which we can all thrive. Amee Raval—policy and research associate for the Asian Pacific Environmental Network (APEN) and a second generation South Asian American—shares that drawing on multiple ways of knowing is central to APEN’s work. An organization dedicated to bringing together low income, immigrant and refugee Asian and Pacific Islander communities to create a collective voice and develop an alternative agenda for environmental, social and economic justice, APEN centers storytelling in their organizing and advocacy efforts. “For us storytelling is really critical; it is not just a way of knowing but a way of healing,” she says. In his book, The Truth about Stories, Cherokee writer and photographer Thomas King writes, “The truth about stories is that’s all we are.” And thus the stories we tell matter a great deal. Many people and cultures across the globe are rooted in the wisdom of stories and we see this practice being brought forth more intentionally and frequently in justice work. When speaking with Sacramento legislators about the need for clean energy in California, APEN community leaders shared stories about the health impacts of living in neighborhoods surrounding a nearby Chevron Refinery. One community member described her children struggling to breathe due to asthma. Another described the circumstances of her neighbors who were dying of cancer. “The whole room was silent; some legislators were crying,” says Amee. “Clean energy can seem so technical and political, so the space for stories isn’t always made.” But it was the community members stories—their lived experiences—that were most influential with legislators. And too, these stories enabled community members—many of whom are refugees that have fled war and upheaval in their home countries only to endure racism, discrimination and other hardships in the United States—to lift up their own resilience and be honored and witnessed in their enduring survival. As we know from the work of Monica Dennis—a Black, feminist, leadership and liberation consultant, and co-director of Move to End Violence—distortion of story is a practice of white dominant culture that furthers oppression. Thus, it is through the reweaving or retelling of our individual and collective stories that we can move toward liberation. Storytelling—holding many perspectives and drawing on cultural and ancestral wisdom—is also central to The Theater Offensive’s mission to present the diversity of lesbian, gay, bisexual, transgender and queer lives in ways that break through personal isolation, challenge the status quo, and build thriving communities. This engagement with multiple ways of knowing goes beyond theater programming. Notes Harold, “we live out multiple truths every day.” Drawing on black culture, as well as black arts traditions such as jazz, is central to Harold’s ability to hold complexity and multiple truths. Unlike many western European traditions that tend to center one plot while subjugating others, black expressive forms such as jazz hold multiplicity—different yet non-competing musical compositions that link, weave and skirt one another. Such facility is critical to holding the many perspectives, needs and experiences of different communities—and bringing them forward in order to develop transformative solutions. For Evelyn Francis, interim artistic director of Theater Offensive and a self-identified femme dyke of white Appalachian origins, centering multiple ways of knowing is core to the Theater’s ‘Out in the Neighborhood Program’ or ‘OUT’hood.’ The program was born out of the invocation of a young, queer Haitian woman who participated in the Theater’s youth program. During an afternoon rehearsal at the theater, she asked, “Why do I have to take two buses and a train to feel [comfortable with] who I am? I want to be out in my neighborhood.” The question became the fulcrum for Theater Offensive’s journey from a more traditional theater company to one rooted in community development and activism. Moving out of formal theaters and into churches and community centers in four communities of color within the greater Boston area was just one of the shifts Theater Offensive made. They also began developing and performing their own theatrical productions, ones that drew from the work, lives and dreams of community members. This deep engagement of community culture, lived experience, ancestral knowledge and additional ways of knowing are the vehicle through which Theater Offensive is affecting cultural change, change that is co-created by the communities themselves. The transformative nature of theater also provides opportunities for all who participate to bear witness to their strengths and begin to heal the intergenerational wounds of systemic racism, patriarchy, and homophobia. Healing these intergenerational wounds, while attempting to heal the systems and people who affect ongoing harm (who are sometimes the same people), requires that we attend to our inner work. There is an increasing number of organizations and networks sharing their collective inner work practices, from organizers and activists to the progressive funders contributing to their work. The inner work practices of grantmakers in particular have a reverberating impact on the capacity of grantees to advance what grantees and communities see is needed. Inner transformation is a focal point for the Hidden Leaf Foundation—a family foundation based in the San Francisco Bay Area. Tara Brown, a white woman, long-time activist, and the founding and former executive director of the foundation, describes the foundation’s efforts as “supporting transformative approaches within change movements.” An essential condition for transformation, Tara says, is spaciousness, it literally, “makes space for transformation [to occur].” Tara and other members of her family have brought their individual inner work practices to their foundation work and practice together before making important philanthropic decisions. In their external grantmaking efforts, the family foundation’s focus has evolved from supporting non-profit leaders in deepening their own leadership and inner work practices to investing in organization-wide transformation through group engagements with deep practice in one or more modalities or traditions. Another dimension of inner work comes from racial equity work that is focused on culturally-rooted healing and resilience practice. This is the cornerstone of Lauren Padilla-Valverde’s efforts for The California Endowment, which has been deeply investing in a 10-year, place-based community change effort in fourteen California regions known as Building Healthy Communities. As Senior Program Manager for East Salinas (Alisal), Lauren uses what she calls a healing-informed, racial equity framework to guide her work with the community to influence a regional ecosystem of government, philanthropy, resident organizing and non-profits to work on systems change that centers a healing informed, racial justice practice. Lauren, the daughter of indigenous Guatemalan immigrants who were forced to flee their country in 1969 because of her father’s community organizing work fighting back land grabs by US national corporations, is driven by her late father’s culturally rooted philosophy on justice. For Lauren, achieving racial equity requires the centering of healing in order to create the conditions for accountability and collective action. Lauren and other community leaders asked members of city government “if [they] were willing to look in the mirror and understand how racism, and other forms of oppression, operate within systems to perpetuate inequity and injustices in the community.” Coming out of this request was the design and creation of a week-long racial healing and racial equity curriculum which brought together 50 community members (BHC leaders, community organizations) and 50 city government leaders and employees—such as law enforcement, planning, public works—local business owners, and nonprofit professionals. This alternate time horizon for change—one the recognizes the complexity of the challenges we are facing and the need for investing in deep relationship building to ensure sustained efforts that move us toward love, dignity and justice for all—foregrounds the importance of creating leaderful ecosystems to create the conditions and a people path forward. LANE is a collaborative program that delivers the methodology and resources to strengthen the financial and organizational health of arts organizations that are geographically isolated; led by and for people of color; and/or are rooted in small to mid-sized community-based groups. LANE is now broadening its focus from arts organizations and funders to social justice efforts more broadly. In doing so, they are embedding arts and culture in social justice as a fulcrum of social transformation. It is through the arts that we can create, at an experiential level, a shared understanding of our vision for the future and simultaneously recreate ourselves and our world. In the Network Weaver Learning Lab, organizational and network leaders of color (and their allies) working in domestic violence prevention and services as well as other intersecting justice issues, such as reproductive and racial justice, came together to deepen their network leadership practice, build greater capacity for collaborating across movements, and cultivate leaderful ecosystems in all their networked social justice efforts. Rooted in the five elements, the Lab became a space for exploring their interconnections. Creating leaderful ecosystems meant deepening equity, addressing power in the room, and holding tension generatively; making the space for and engaging in shared practices of inner work; drawing on multiple ways of knowing to re-member the wisdom of our communities, our ancestors, the land on which we gathered; and making visible the interconnected systems that perpetuate injustices in order to create approaches to transform these systems. Another experience of the interplay of these five elements took place just over a year ago at MAG’s Confluence. A two-day gathering of approximately 90 of MAG’s partners and friends working on issues of justice, it was described by many as a “liberated zone.” The experience of liberation was the result of many aspects of the gathering, but the foundation of Confluence’s design—both in terms of what we dove into and our ways of moving in the waters in which we swam—was the five elements and the interplay of this five-fingered hand. What we’ve learned through these experiences, and others, is the critical nature of “deep hanging out” (hat tip to Chris Barahona—an Urban Futures Lab Fellow—who lifted up this concept for us, originally from anthropologist Clifford Geertz). Deep hanging out entails building relationships and trust so we can wrestle with the hard stuff; focusing on the intersectionality of oppressions and liberation; building muscles for collaboration and networked approaches to leadership; developing experiments to create possibilities for new and improved outcomes; and being in right relationship with change. Through embodying these five vital elements together, our five fingers becoming not just one hand but many hands playing together, creating music that is expansive and interdependent enough to hold improvisation—our contrary, melodic and syncopated rhythms—connecting us to one another and to the invocation of our song: a world filled with love, dignity and justice. With gratitude to Design Action Collective for creating the above poster.